Commissioned by Brunel 200, An audience with Sarah Guppy , a new play by Sheila Hannon about an amazing inventor and designer. An audience with Sarah Guppy will tour in 2008 and beyond. It is suitable for conventional venues and non-theatre spaces (including schools) as technical requirements are minimum. Kim Hicks plays the remarkable woman who also taught IK Brunel more than a thing or two about suspension bridges. Mother of Brunel’s colleague and backer Thomas, Sarah Guppy was responsible for bringing Brunel to Bristol in the first place. Sponsored by Hitachi with an interactive whiteboard, this innovative performance uses twenty first century technology to bring the achievements of an extraordinary eighteenth century female engineer to life. 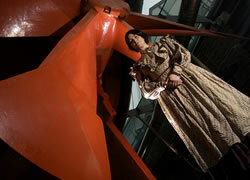 Students at City of Bristol College have recreated her designs in 3D which are incorporated into the performance. Directed by Alan Dossor, whose extensive credits include West End and Broadway, the production has toured Bristol and the region (SS Great Britain; Everyman Theatre, Cheltenham) to great acclaim and was shortlisted for 2006’s Engineering Media Challenge Awards. Contact us to find out more about booking a performance.